Create your temporary home at Residence Inn New York Manhattan/Central Park. 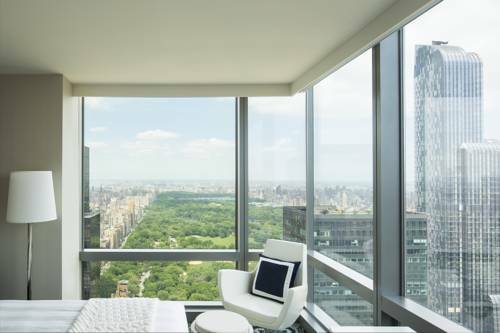 As America's tallest hotel in a central Midtown location, we make it easy to experience all New York City has to offer including Times Square, Broadway Theatre, Carnegie Hall and Lincoln Center. Central Park is right outside of our hotel, allowing you to take a scenic stroll away from the hustle and bustle of the city whenever you please. When it's time to wind down, live in true comfort with our modern suites featuring chic furnishings and floor-to-ceiling windows boasting breathtaking views. Deluxe kitchenettes, large workspaces and complimentary Wi-Fi are also included, making it easy to maintain your routines. In the morning, fuel up for an adventure-filled day with our complimentary breakfast. Traveling on business? Utilize one of our impressive meeting venues, or host a company party on our Sky Terrace. Reserve your getaway at Residence Inn New York Manhattan/Central Park and discover an artistic twist to your extended stay.